BLUETOOTH STEREO EARBUDS. Earbuds work with iOS & Android devices. Fits in ear, provides quality stereo sound. 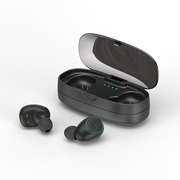 Features are Bluetooth 4.2, noise-reduction, bass boost, up to 3.5 hours, works with Siri & Google Assistant, charging case. Ergonomic Design: Earbuds fit securely and deliver great stereo sound.